You'll fall in love with these precious baby shower invites. Choosing your baby shower theme, shower decorations, and invitations is one of the biggest milestones of your pregnancy. It’s a time you'll look back on in the many years to come and recall all of your closest friends and family gathered together to celebrate your pregnancy (or adoption). The day will be all about you and that little baby of yours. You want every detail to be perfect, starting with the baby shower invitations. 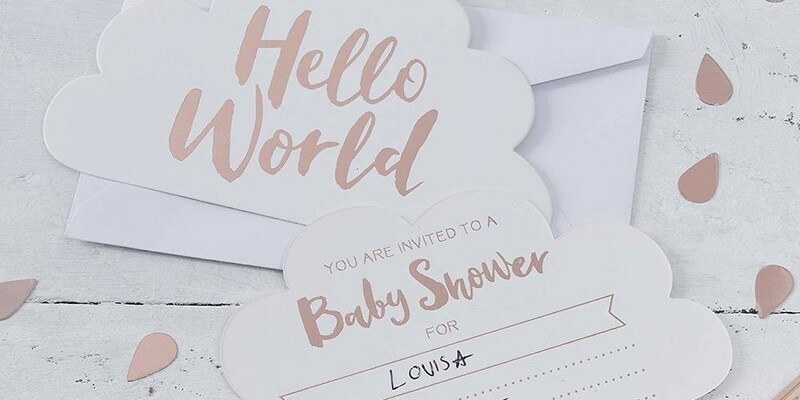 With so much to think about as you plan your baby shower, it’s easy to overlook invitations, but they really are a crucial part of the party — especially if you're going with a specific theme. You want to make sure the invitations are a reflection of your personality and what your guests should expect at the shower. They should include everything that your guests need to know about your special day as well as directions and baby registry information. When you choose your baby shower invitations, don't forget to pay attention to details. After all, this'll be the first glimpse of your shower guests get before they arrive and it will truly set the scene for the day. 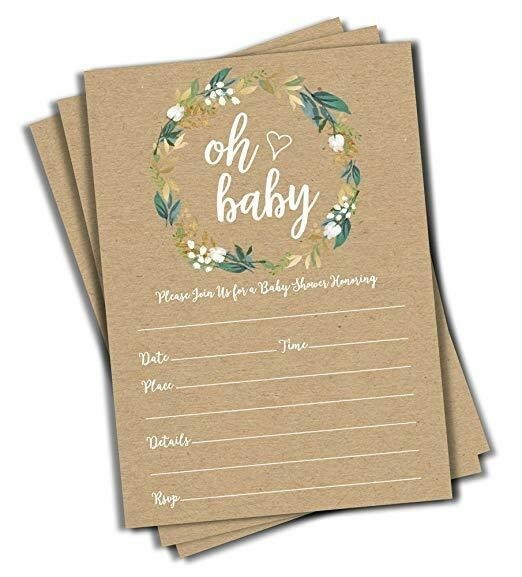 With so many different types of baby shower invitations to choose from — handwritten, keepsake, gender neutral, and even some that move — you need a clear idea of what you want. 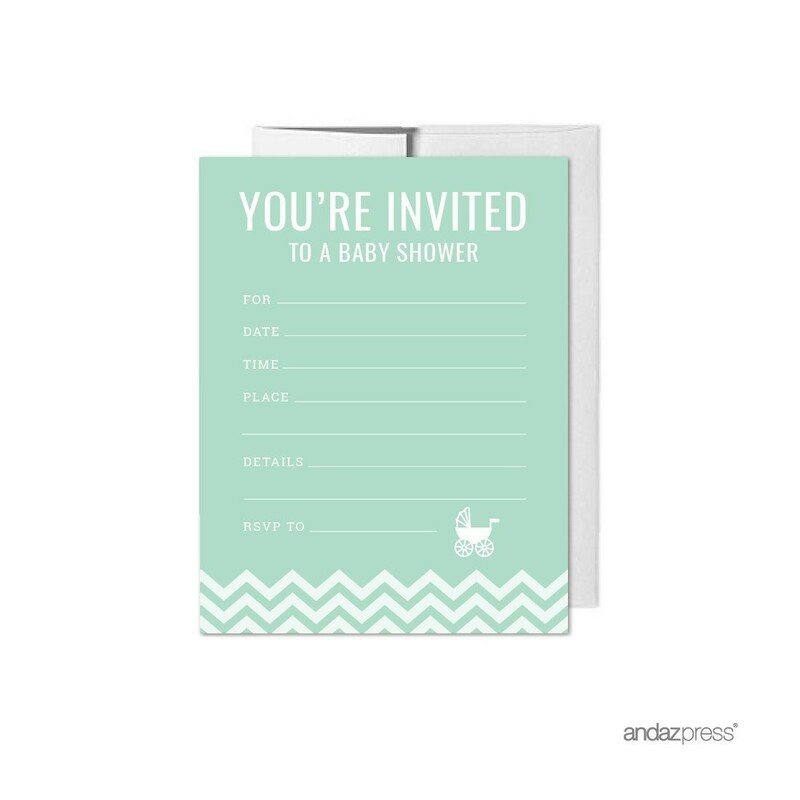 If budget is a concern, you can even opt for homemade baby shower invitations for your closest guests. Luckily, we’ve got a little bit of everything here for you to choose from! These adorable foiled "Hello World" baby shower invitations by Ginger Ray are perfect for any upcoming baby shower! 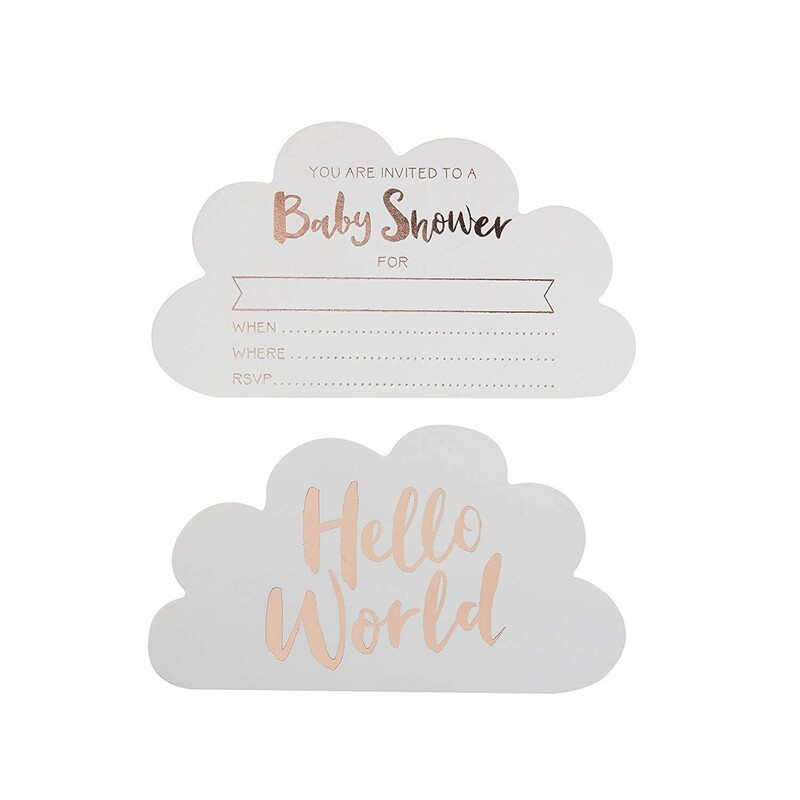 They are unique because of their cloud shape, but very modern and on trend with their rose gold foiled lettering and squiggly writing. 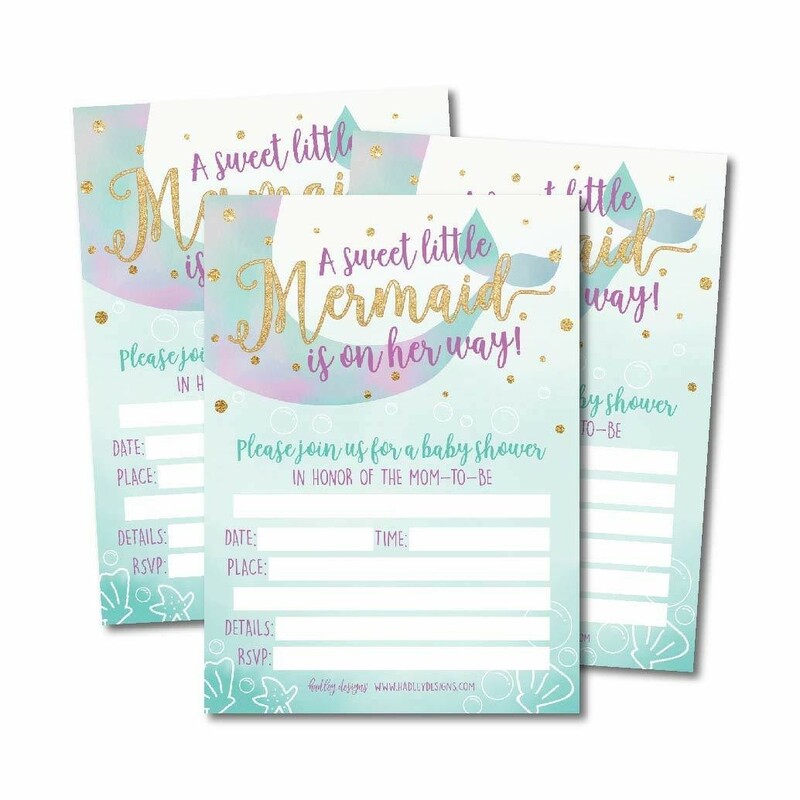 You can easily personalize them with your baby shower information on the back and they are sure to be adored by your loved ones. With the Little Man Mustache trend being so popular in the world of baby showers for all mamas expecting boys, this baby shower invitation compliments the theme in the sweetest way. 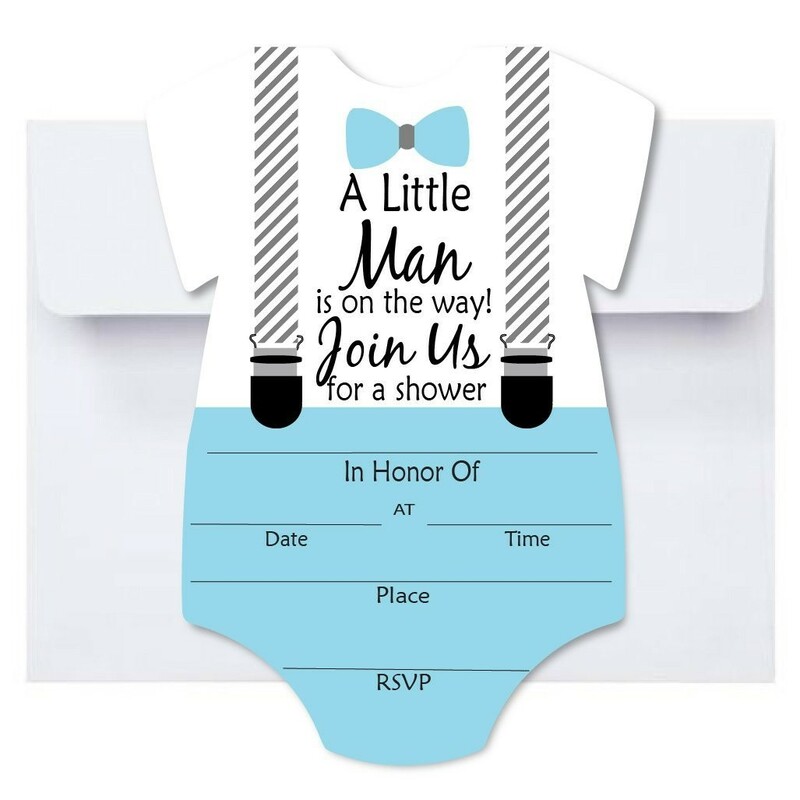 Complete with suspenders, this blue, gray and black Little Man Onesie Invitation is an adorable piece of mail for your guests to receive. Whether you are hopping on the Boho baby shower trend bandwagon or simply going for a feminine, Earthy feel, these Oh Baby Craft Greenery Invitations are simply stunning! The card stock is thick (making them stand out even more) and each invitation is simple in design, oversized, and sure to wow your guests. As an added bonus, they are made in the US. 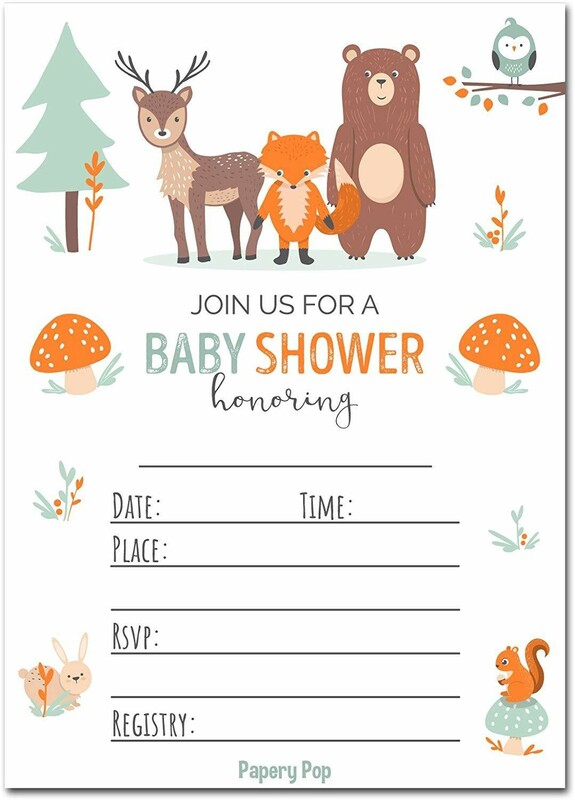 These absolutely adorable and gender neutral Woodland Animal Baby Shower Invitations are certain to steal your heart! Printed on heavyweight matte card stock with a white background, they are in shades of vibrant orange and muted blues and browns — the perfect combination of hues for a fall or winter shower. Your guest will honestly fall in love with the fox, deer, bunny, and owl and won't be able to see what else is in store for them whenever they come to celebrate your special day. 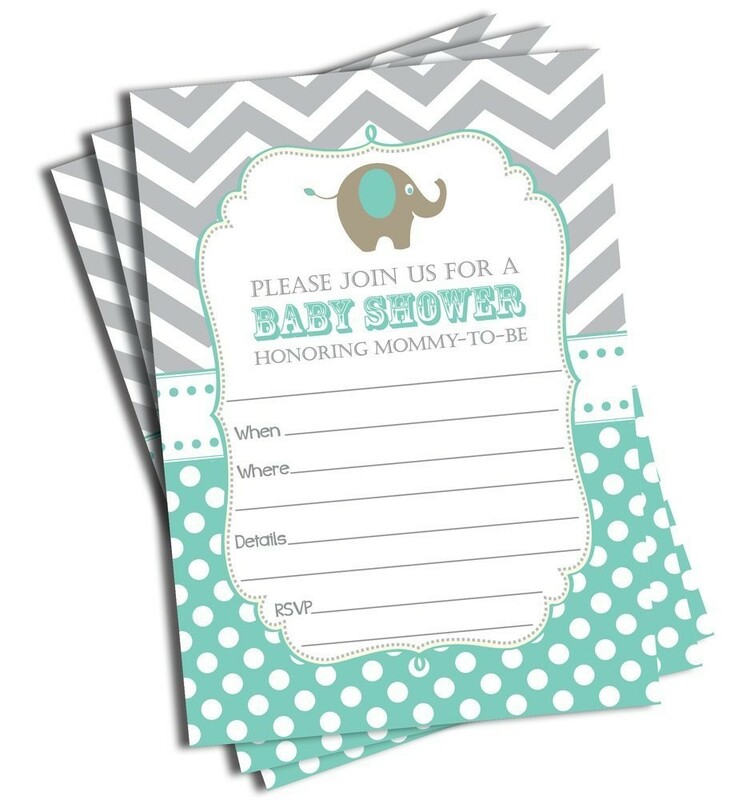 Perfect for a gender neutral, or boy or girl shower, these mint colored Elephant Baby Shower Invitations are too cute to pass by! Not only are they decorated with popular modern gray and mint hues and bring together the uber trendy polka dots and chevron designs, but we also love how they outline that the shower is to honor the mommy-to-be. And you honestly can't go wrong with anything Elephant designed when it comes to baby shower planning. More sweet baby animals to make your mama-to-be heart go pitter patter! 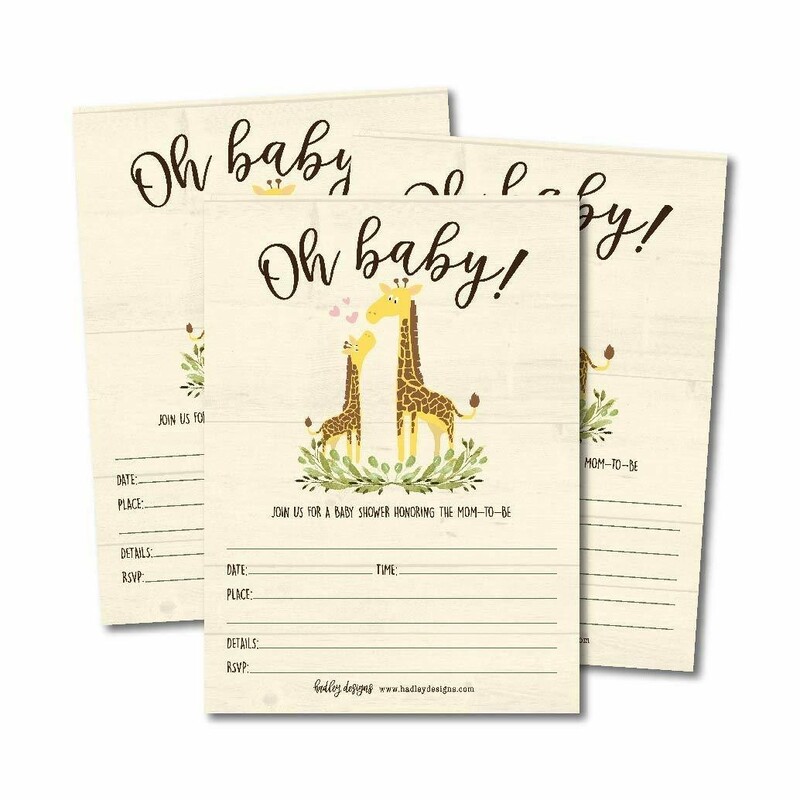 These gender-neutral Giraffe Invitations are easy to write on, as they are printed on thick card stock and will seriously make all of your guest swoon. Whether you have a giraffe or animal theme planned or not, they are sure to set the stage for a wonderful and memory filled baby shower. 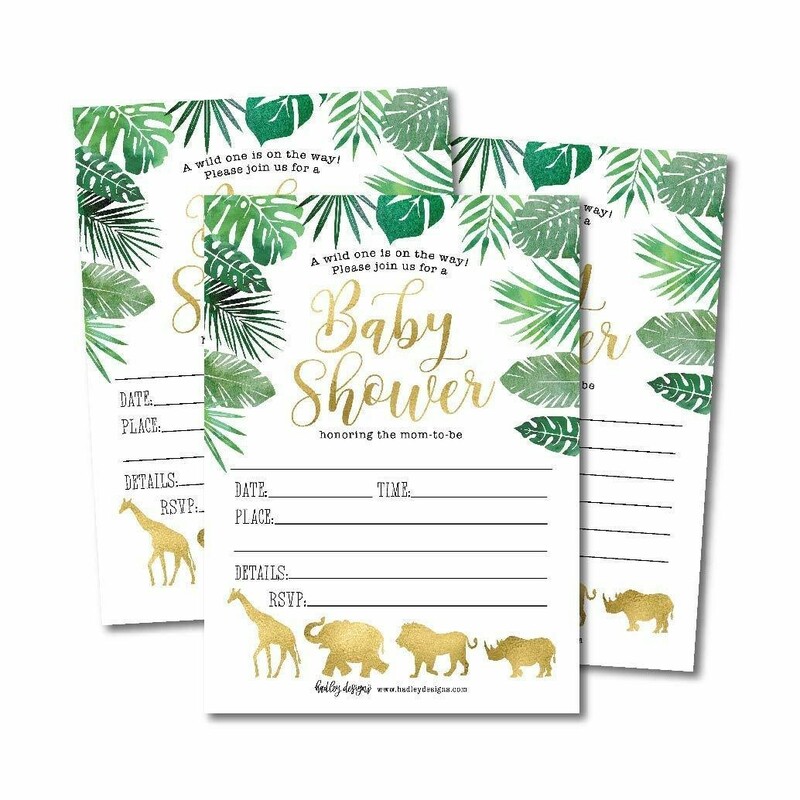 Honestly, animals and baby showers just go hand in hand and these Safari Invitations are no different! Adorned in stunning green and gold on vibrant white card stock, your guests will feel like they are in the midst of a safari as soon as they open the envelope. 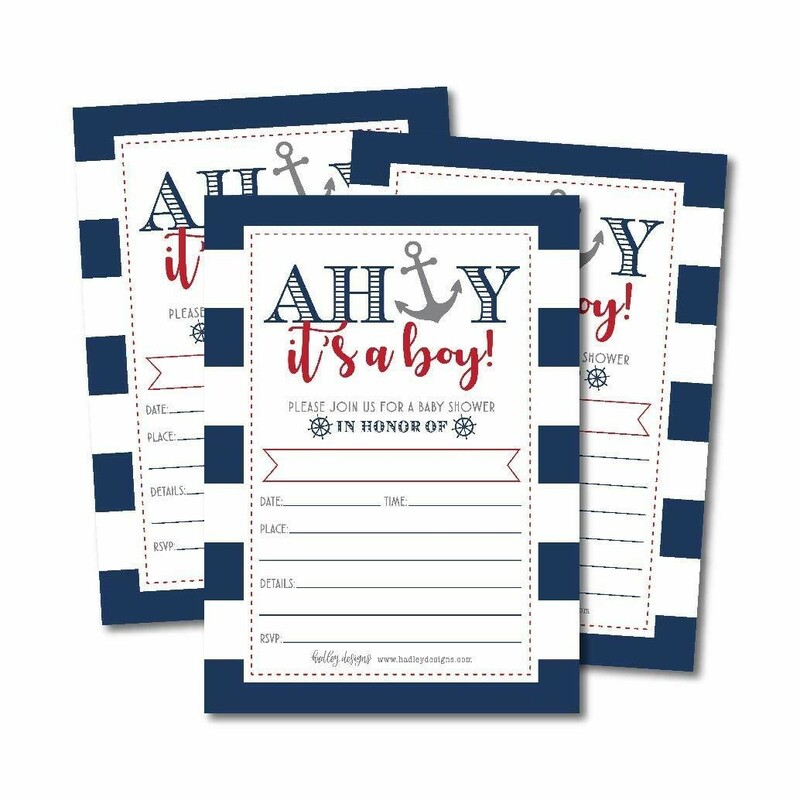 If you're expecting a boy and planning on throwing a sailor baby shower, these navy, white and red, "Ahoy, It's a Boy!" baby shower invitations are the sweetest and most nautical. You are certain to get your guests excited about coming to celebrate mommy-to-be, and the little gentleman on the way, as soon as they open the envelope. Red, green, winter flowers, oh my! If you have a winter or holiday baby on the way, these "Oh Baby, It's Cold Outside!" baby invitations are just what you need to make your special day complete. The special invitations filled with so much holiday cheer are made in the United States and feature iconic holiday flowers such as winter poinsettia, holly, pine cones, pine leaves and floral elements, all surrounded by vibrant holiday tones. There is no denying the popularity of mermaid everything right now. The whimsical colors of blues, greens, purples, and golds are very dreamy and a fun way to celebrate bringing a new baby into the world. These Mermaid baby shower invitations are a great way to set the tone for an under the sea adventure and memorable shower. 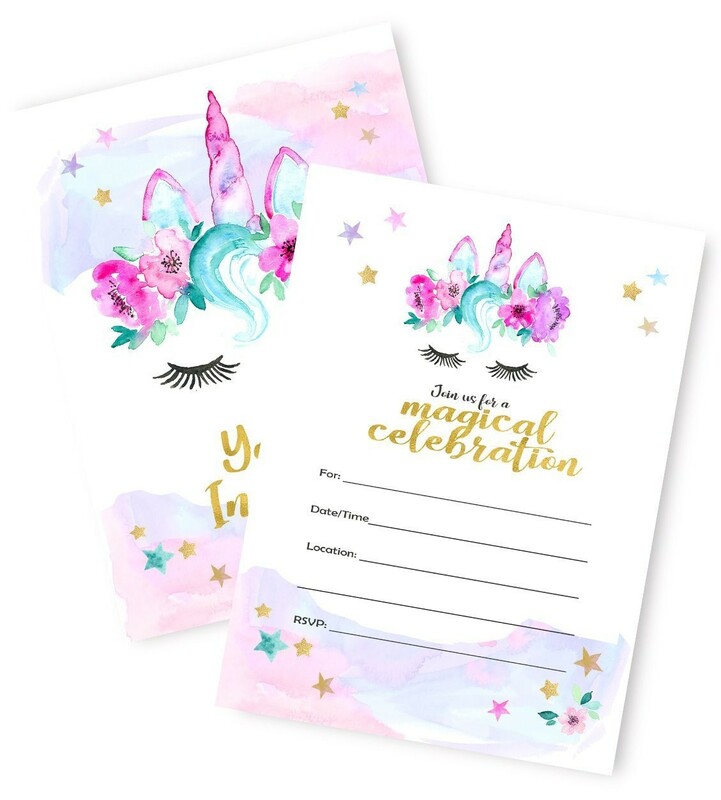 A truly magical baby shower celebration starts with the Magical Unicorn baby shower invitations! The dreamy hues of colors swirled together using watercolors will make your guests respond with an immediate "yes." 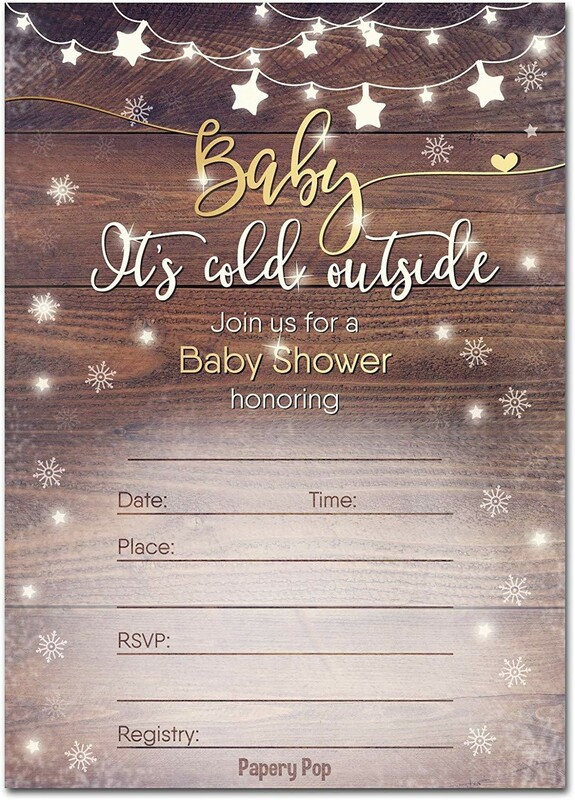 Not only are these baby shower invitations gorgeous, but they are made in the United States using only original artwork and are double sided and guaranteed to set a magical mood for your event. 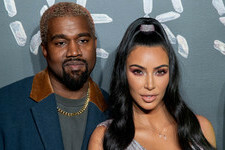 We're sure there's going to be an awful lot of Twinkle, Twinkle, Little Star singing in your future, so building your shower around that sweet tune is a wonderful way to celebrate your pregnancy. 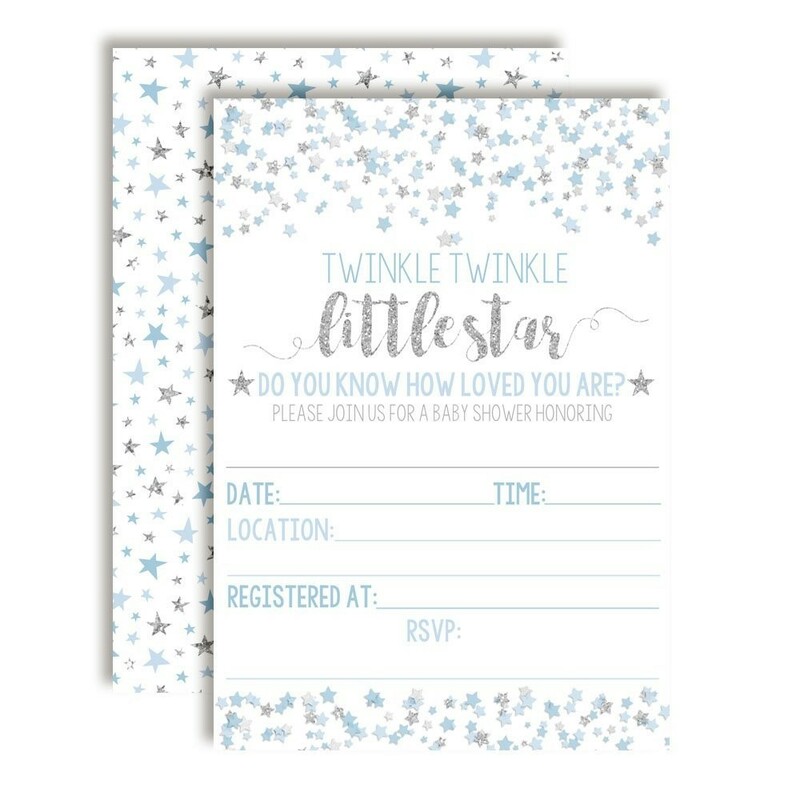 These Twinkle Twinkle invitations do just that as they are filled to the brim with beautiful stars and just the right amount of sparkle. There is no denying that having a baby is truly the most epic adventure of a lifetime, so why not plan your whole baby shower around that theme? 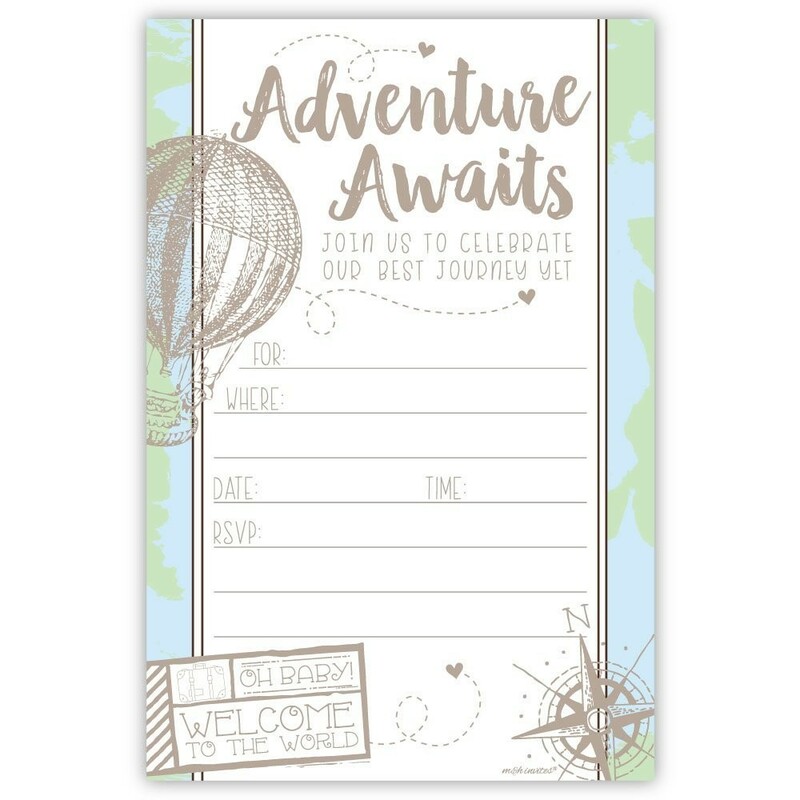 These sweet Adventure Awaits baby shower invitations will emulate your love for traveling the world and all the adventure that's about to enter your life on a daily basis when your little arrival gets here! Multi-colored polka dots and chevron lines bring this simple baby shower invitation to life. 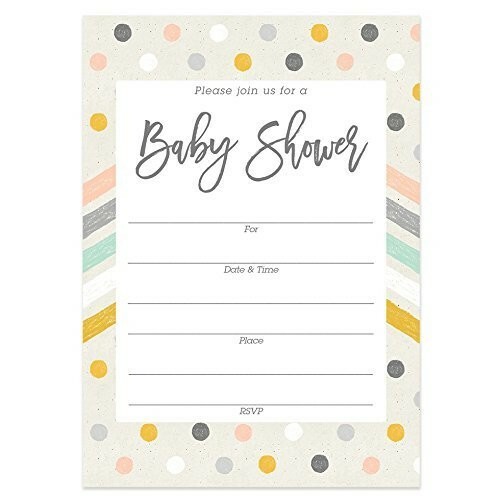 There's nothing wrong with going a more basic route, and these Polka Dot invitations are the perfect combination of muted tones and pastel hues to celebrate your pregnancy in a gender-neutral way. We all know that the baby mobile is pretty much the center of your nursery, so building your shower around something that will be a part of their life and help soothe them to sleep on a nightly basis is a pretty fantastic way to celebrate. These Baby Mobile Baby Shower Invitations are the sweetest. They are gender-neutral and printed on premium card stock — perfect for your special day! Nothing sounds more fun than taking your baby shower to a whole new level by turning it into a baby bash. 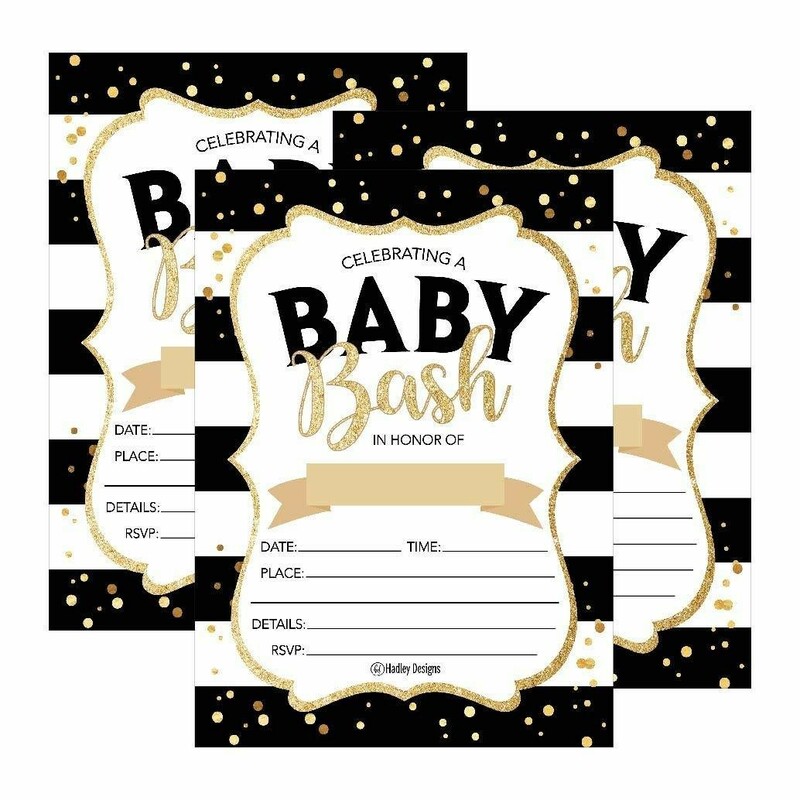 These fun and sparkly Baby Bash baby shower invitations will do just that is a really fun, gender-neutral way! 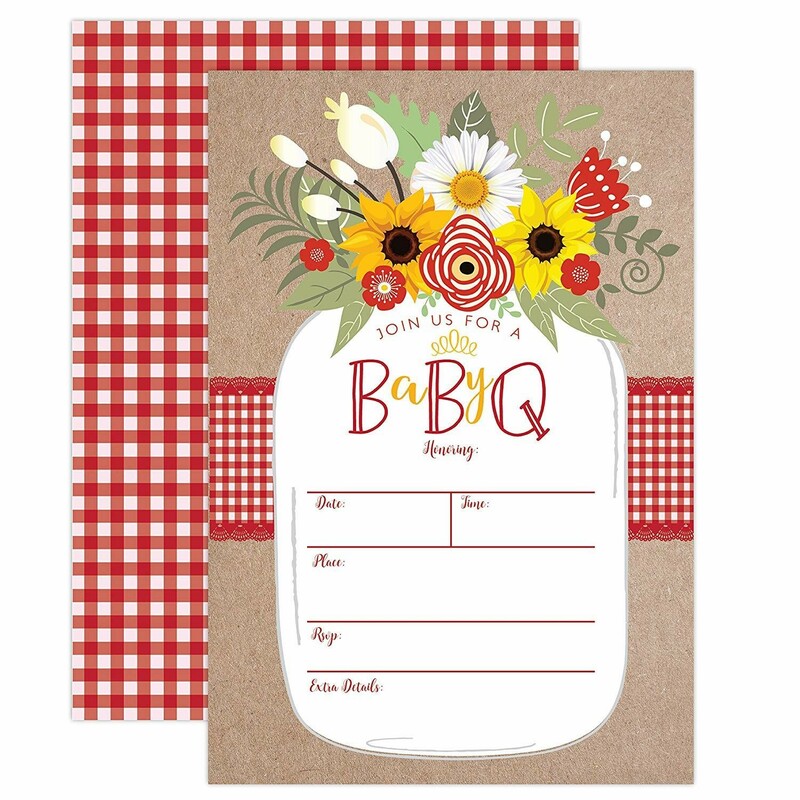 If planning a co-ed Baby-Q shower is in your plans, then these Baby BBQ Invitations should be on your radar. Guests will open their baby shower invitations and immediately feel like they are at a picnic table and ready to celebrate. 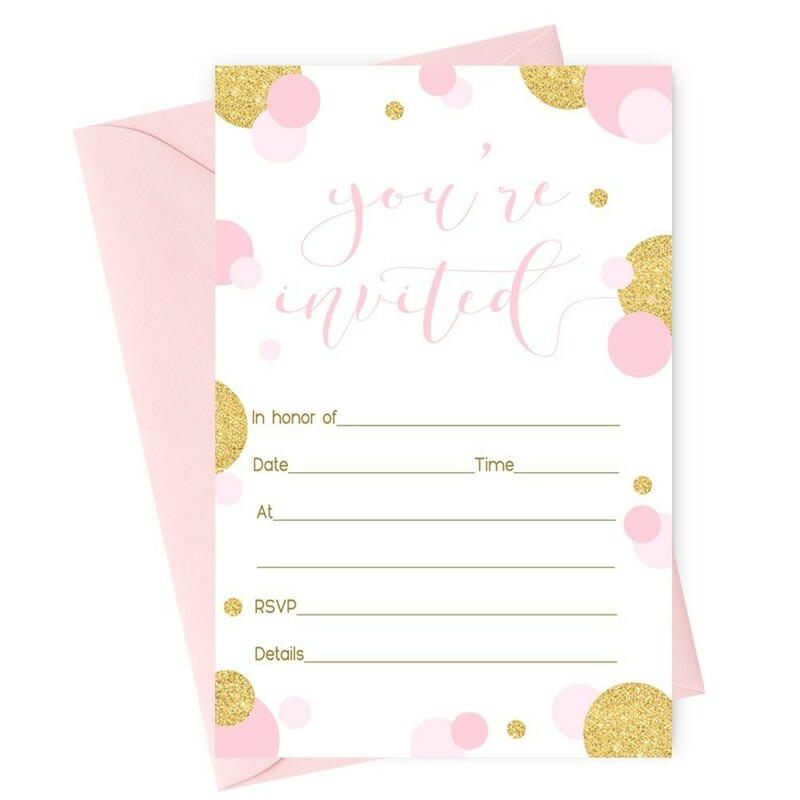 These super feminine Abstract Invitations are perfect if you're expecting a little girl. Filled with everything girly and sparkly, they are a great way to let your guests know that lots of pink is heading their way! 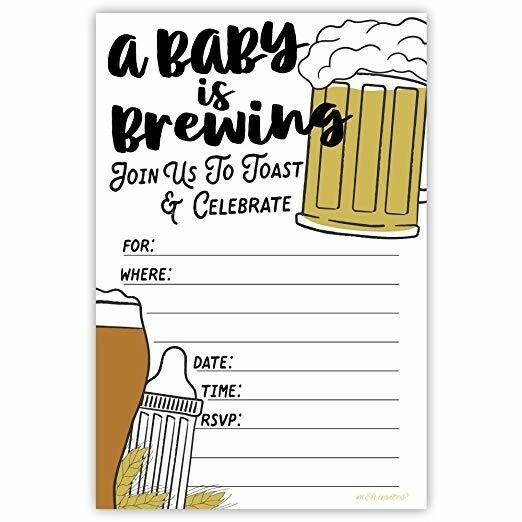 If you and your partner want to celebrate your pregnancy together and you both have a great sense of humor, then you'll want to send these "A Baby is Brewing" baby shower invitations to your friends as soon as possible. Perfect for your joint couple shower, these invites are gender-neutral and printed on matte card stock. 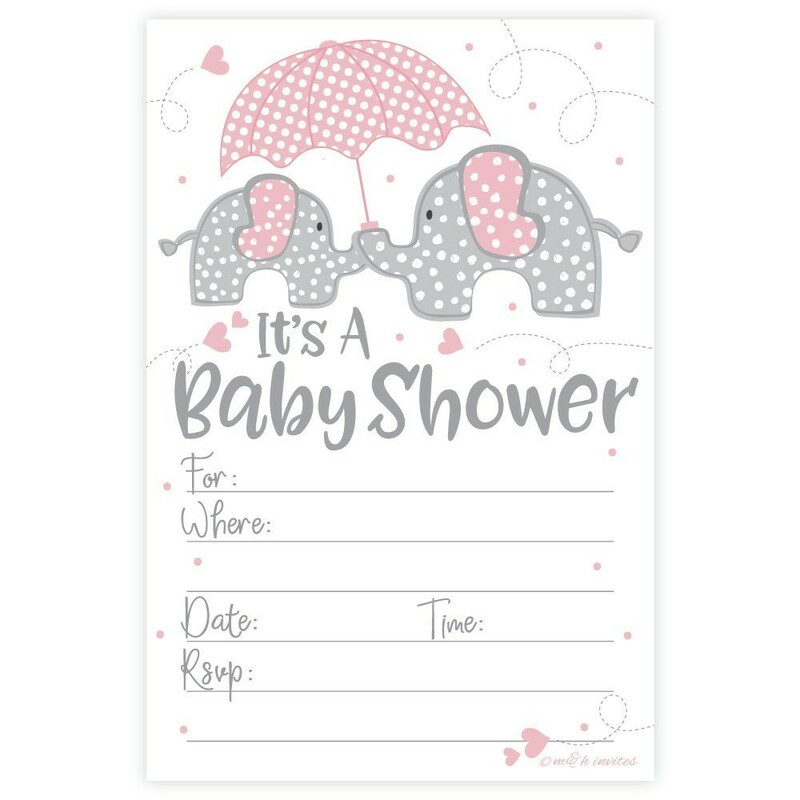 Taking the words "baby shower" into a very cute, but literal sense, these invitations picture the sweetest little elephants hiding from a rain shower. You can't go wrong with elephants and pink hearts with these Pink Elephant invitations for your special day. If you are on the hunt for simple baby shower invitations, you will have so much love for these sweet, Mint Green Chevron Invitations. 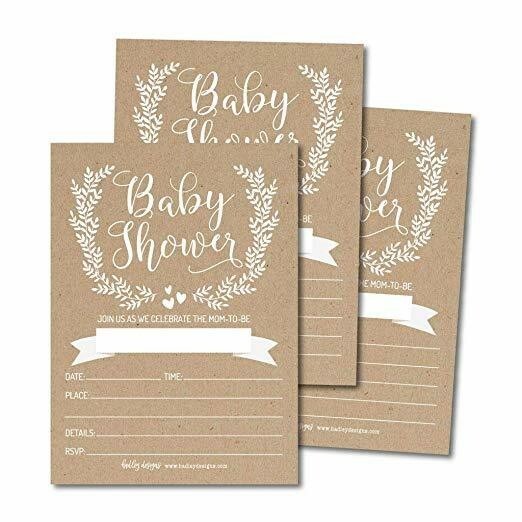 Not only are they gender neutral, but they are a very cute way to get your guests excited for your celebration and will look beautiful displayed in your baby book. You can't have a little Prince option without one for a little Princess! 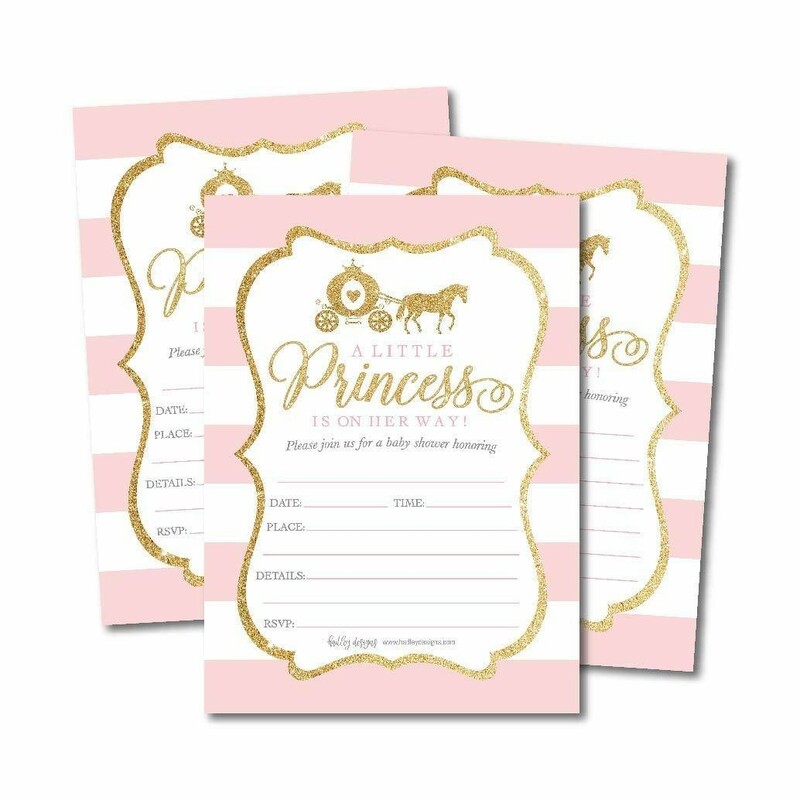 These sweet pink and white stripe Little Princess baby shower invitations with swirls of gold sparkles and a horse-drawn carriage are truly fit for royalty. Now just make sure that your guests receive a crown upon arrival! Rustic baby shower invitations are a great way to invite your guest in a gender-neutral way. 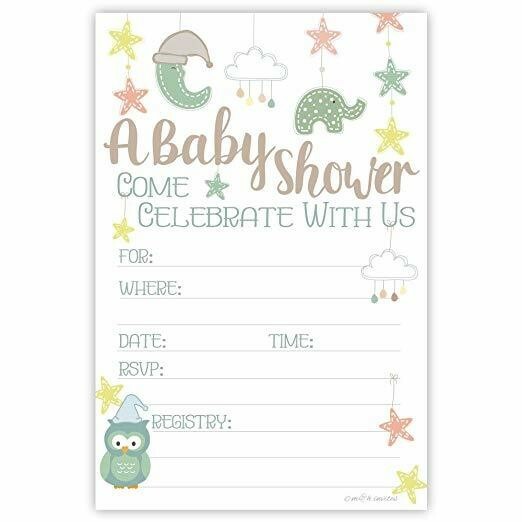 These are printed on light brown card stock instead of a more traditional white, letting them stand out and show how truly unique your baby shower will be. Sometimes, there is nothing that really compares with going with tradition — especially whenever it comes to a baby shower. 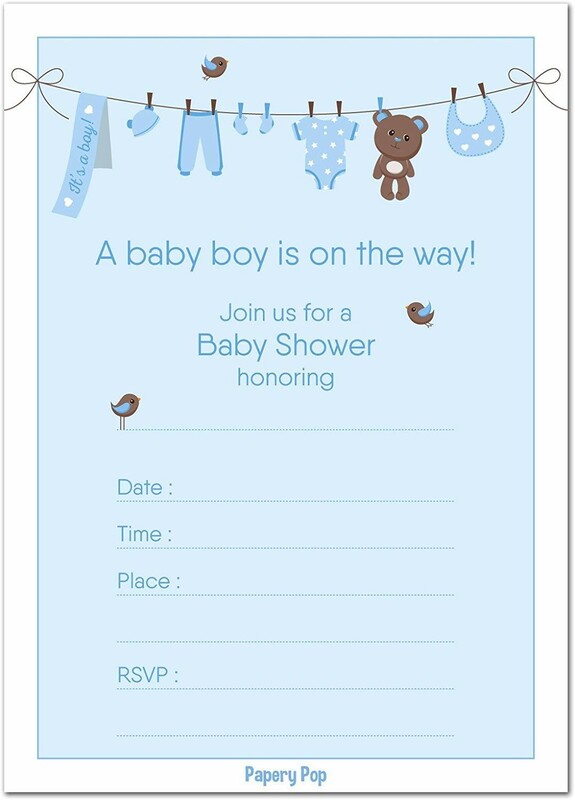 If you are expecting a boy, these Baby Boy Invitations come in classic blue with all those sweet baby boy must-haves hanging on a clothesline. 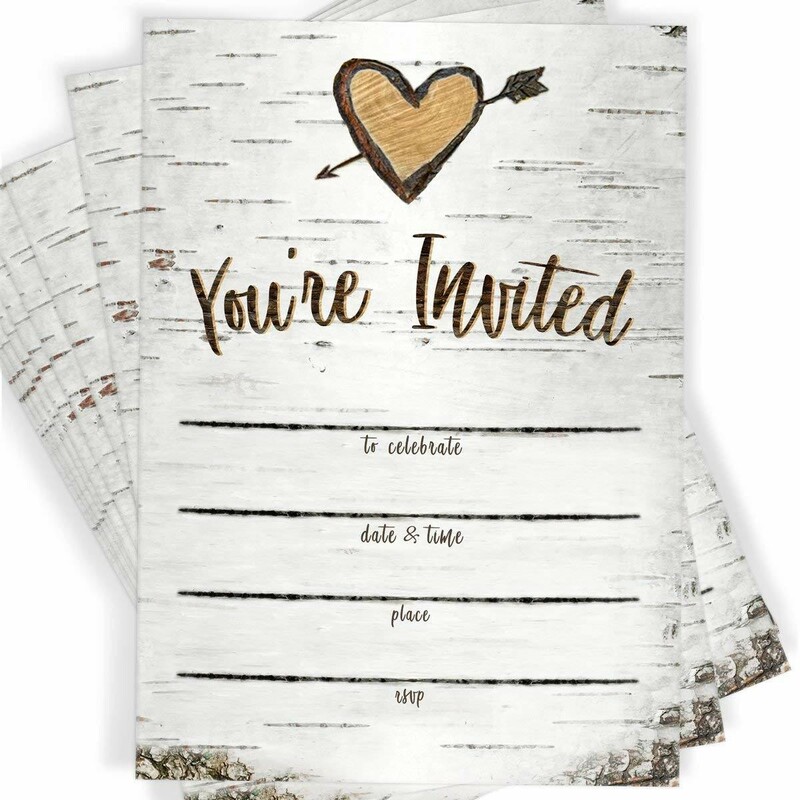 The opposite of classic, these Birch Tree invitations emulate the rustic vibes and boho chic trends that we have been seeing everywhere. They are simple but durable and easy to write on and printed on heavyweight stock, so they can easily serve as a memory in your baby book!